Some of you may have already seen this picture I posted on Facebook a couple months ago. Ben E. is one of Daphne's kindergarten classmates. A lovely bouquet of "flowers" (Did your Mom help you? Was this your idea???) and a somewhat indecipherable love note. At first, we found the sheer number of people (and partial people) depicted mildly disturbing. But now we interpret it as several attempts to get the scene just the way he wanted it (the two people on the far left?). After all, what love-letter writer hasn't scratched out and revised in the quest for the perfect words (or stick figures)? 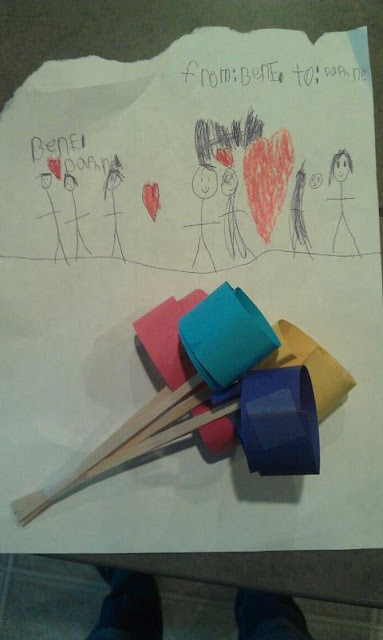 When asked what she thought of Ben E. after receiving this note, Daphne had said, "He's pretty much my boyfriend." Today, Daphne is bringing the following picture to school for Ben E.
Wow. What could have been. Who wouldn't be madly in love with a gal who's that creative!